As Snapchat looks to improve its business prospects in the face of slowing audience growth , one area that it's keen to expand upon is gaming. Snapchat has been slowly adding in more interactive games and features - within the Lens carousel, there's now a whole range of AR games, or ' Snappables ', which you can play by yourself or with friends. The next stage of this, according to a new report from Cheddar , will be a dedicated Snapchat gaming platform, which w ill feature a range of games from outside developers that are designed to work specifically in the app. Following this, last June, The Information reported that Snap was "preparing to launch a platform that would let outside developers create games to be played through the Snapchat app". It makes perfect sense for Snapchat, given the app's younger user base, to put more focus on gaming content, which could open up major revenue opportunities through in-game purchases or advertising. Underlining the potential, a recent study from Slice Intelligence found that mobile gamers spent an average of $87 dollars on their “free-to-play” games in 2018. If, for example, Snapchat was able to host the next 'Pokemon Go', that could be a major coup for the app, while it could also help re-ignite user growth by attracting more players to the platform. And for advertisers, that could be another key consideration. Just this week, Facebook announced that it's now rolling out a new, dedicated tab for games in the main navigation bar for some users, as The Social Network seeks to tap into the growing gaming market. The mobile gaming sector is projected to generate around 52% of the $152 billion gaming industry in 2019 , underlining the significance of the market - and as more of those players come online, that's even more opportunities to show them ads, which could be another way for brands to reach engaged, high spending audiences. 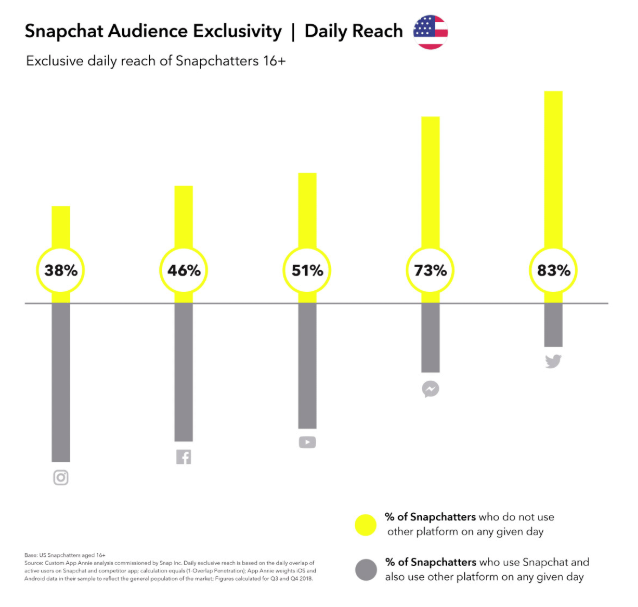 Snapchat already performs well on this front - according to internal data , S napchatters spend an average of 30 minutes per day in the app, while many of those users are also not reachable on other platforms . Adding in another way to boost engagement may also prove lucrative - even if Snapchat can't continue to grow its total audience, if it can lift overall engagement, while also providing reach to a unique, valuable market sector, that, too, will likely attract increased ad spend. That's a key focus for the company - in its most recent performance update , Snap reported that it had reached a new record of $390 million in revenue for the quarter, up 36% year-over-year. While its audience growth has stagnated, the market responded positively to the improved revenue focus - an area where an increased push into gaming could prove significantly beneficial. The involvement of Tencent makes the proposal even more appealing - we'll have to wait and see if Snap does, in fact, come out with a new gaming platform, and what the specific details of it might be. But the indicators all point to this being a smart move for the app. The midterms had record voter turnout. Should Snapchat get credit? How Can You Measure Your Social Brand Equity?